Epoch Slide™ presentation management system eliminates businesses chaos by managing 1000s of slides in a centralized presentation management system. You need presentation management if you store your PowerPoint on your company’s shared network drive that is scattered in many folders, sub-folders, desktops and email inboxes. Executives, managers, and speakers are spending way too much time using email, shared drive, SharePoint slide library or enterprise CMS to search, locate and download slides, presentations, and documents for their next sales opportunity. 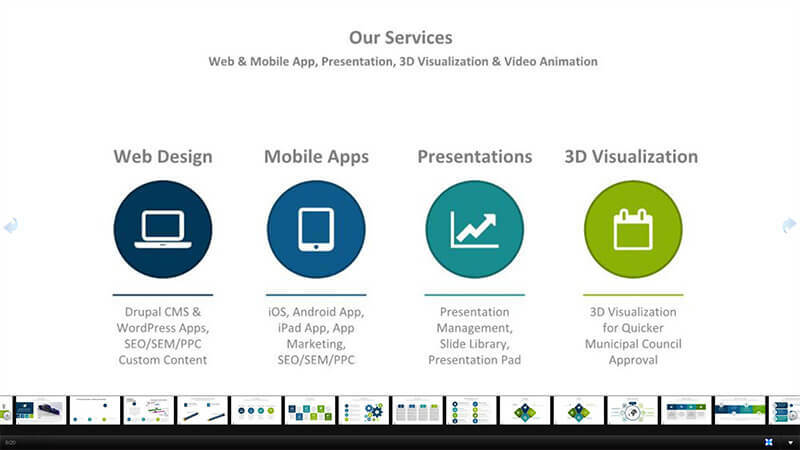 Epoch Slide™ provides a better and more intuitive way to build customs presentations. Epoch Slide™ presentation management for PowerPoint content is a powerful must-have sales enablement tool. Your company’s centralized slide library provides necessary communication to multiple secure channels. You disseminate approved slides, presentations and documents throughout your organization in a safe, consistent and easy way, while keeping your brand consistent. Epoch Slide™ provides brand consistency and facilitates in delivering the right message throughout sales, marketing, communication, training and others departments within in your organization, your customers, and external users. Epoch Slide™ increases your teams’ productivity by providing anytime anywhere online access to a “killer eTool“ that rocks! We invite you to become our Charter Client Partners and discover the true value of the benefits of a presentation management system. Your investment in Epoch Slide™ presentation management system will show favorable results for your company within the month of use. Please take a moment to review the four case studies provided.